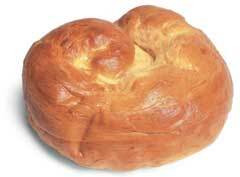 "Rosca" is Ladino (the language spoken by Jews exiled from Spain and their descendants) for “round.” It is challah dough rolled flat, spread with yummy ingredients: sugar, cinnamon, nuts, dried fruit if you like, then rolled into a snake, coiled and baked in a round pan. It's kind of a Sephardic version of babka or cinnamon bread. It results in great nibbling all Shabbat and makes for the most decadent French toast on Sunday morning. 1. On a flat floured surface, roll dough into a large rectangle 1/4 inch thick. 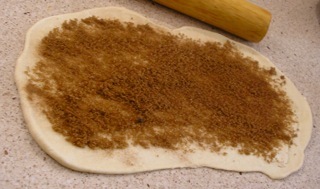 Spread cinnamon, sugar, nuts and fruit, if using, over entire surface, leaving about 1” border on all four sides. Starting at the long side closest to you, roll the dough, jelly roll style into a long snake shape. 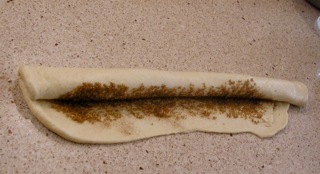 Press the loose edge into the dough to seal. Coil the dough into a snug circle, tuck the loose end under the coil. 2. Preheat oven to 350 degrees. 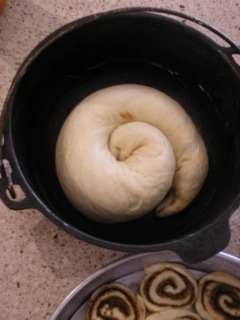 Place coil in a round, well greased cake pan, seam side down, and allow to rise in a draft free place until double in size, 30 minutes to one hour. 3. Brush top with beaten egg. Bake in preheated oven for 25 to 30 minutes until golden. Be careful; when removing pan from oven as the melted sugar often drips and will burn. Cool in pan 15 minutes until sugar begins to firm, then carefully remove loaf to wire rack and cool completely.